Anomalous mitral arcade is a rare congenital abnormality of the mitral valve and its tensor apparatus resulting in mitral insufficiency, mitral stenosis, or both. It is considered to be the most difficult mitral valve abnormality that can be reconstructed surgically, especially at a later age. Accordingly, we report an adolescent girl who underwent successful surgical repair for anomalous mitral arcade. A 13-year-old girl child presented with progressively worsening exertional dyspnea for 4 years. She was in functional class III at presentation. She had intermittent pedal edema for the past 2 years. There was no history of rheumatic fever in the past. She was born of a full-term vaginal delivery with an uneventful perinatal history. However, developmental milestones were delayed with mild mental retardation. The patient also had continuous drip incontinence since birth due to an ectopic ureter. On examination, heart rate was 88 bpm and regular. Blood pressure of 106/84 mmHg was noted. There was jugular venous distension with hepatomegaly and pedal edema. Cardiovascular examination revealed normal first heart sound and loud pulmonary component of the second heart sound. No additional heart sounds were heard. A long mid-diastolic murmur at the apex and a 3/6 pansystolic murmur at the lower left sternal border were heard. 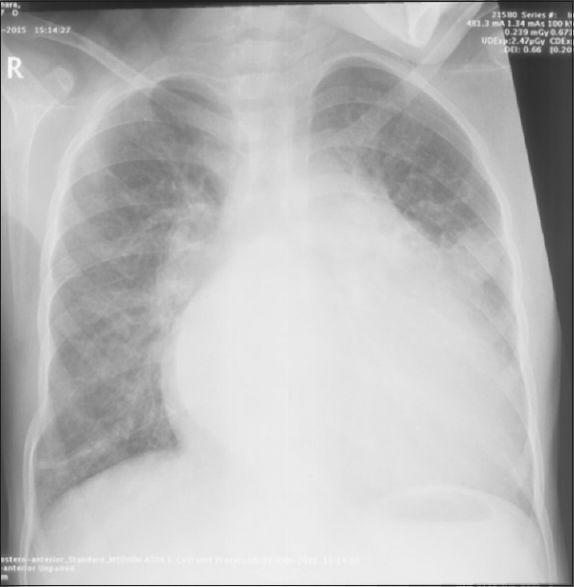 X-ray of the chest showed cardiomegaly, significant biatrial enlargement, and pulmonary venous hypertension [Figure 1]. 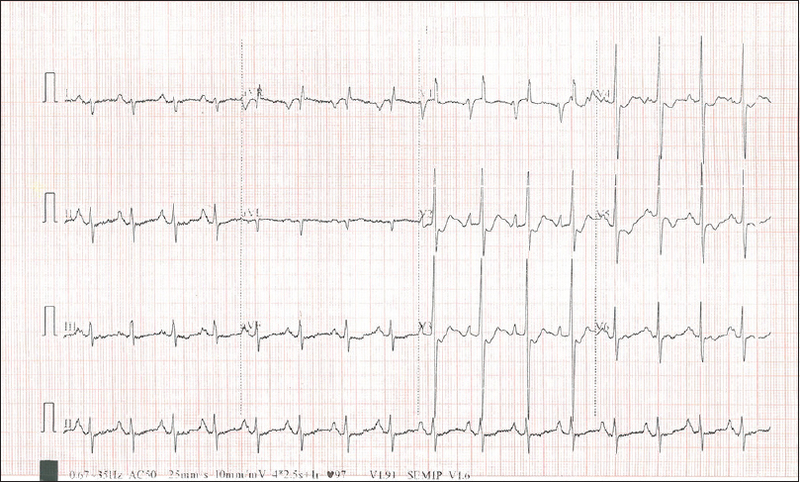 Electrocardiogram showed sinus rhythm, right axis deviation, biatrial abnormality, and right ventricular hypertrophy [Figure 2]. Routine blood investigations were within normal limits except for mild anemia. Echocardiography [Video 1]a,[Video 1]b,[Video 1]c revealed mitral stenosis with a mean diastolic gradient of 12 mmHg. Evaluation of the mitral valve showed a direct attachment of papillary muscles to the mitral leaflets with no intervening chordae suggestive of anomalous mitral arcade [Figure 3]. Mild mitral regurgitation was present. Severe tricuspid regurgitation was noted with right atrial and right ventricular enlargement. Severe pulmonary artery hypertension was noted. The right ventricular pressure was increased at 70 mmHg above the right atrial pressure. There was massive enlargement of the left atrium with a maximum diameter of 70 mm. Biventricular contractile function was normal. Magnetic resonance urography for urogenital anomalies revealed partial duplication of left ureter, ectopic insertion of distal left ureter into vaginal vault, and absent uterus. Moderate left ureteronephrosis was noted. After decongestion, the patient was referred to surgery for mitral valve repair. The diagnosis was confirmed at operation. 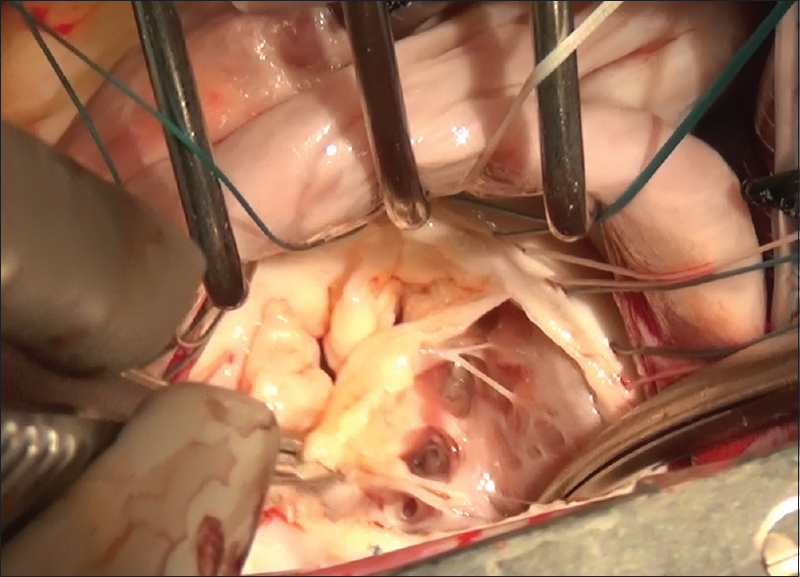 Intraoperatively, the papillary muscles were observed to be reaching up to the thickened mitral valve leaflets with absent chordae suggestive of anomalous mitral arcade [Video 2] and [Figure 4]. A small central opening was noted in the subvalvular apparatus. Commissural fusion was present. Cardiomegaly was present with tense significantly dilated right and left atria. Tricuspid annulus was dilated with normal leaflets. Since sufficient amount of valvular tissue was present with adequate leaflet flexibility, surgical repair was undertaken. Incision was made 2 mm away from the annulus on the posterior mitral leaflet, and it was completely detached till the commissures (which was later augmented with glutaraldehyde-treated pericardial patch). Circumferential release of both mitral leaflets was done with multiple fenestrations. Papillary muscles were released from the leaflets. Annular dilation was corrected with implantation of a Carpentier-Edwards Physio-ring 30. Posterior mitral leaflet was augmented with autologous pericardial patch. Tricuspid valve annuloplasty was done with minimal residual tricuspid regurgitation. The postoperative course was uneventful. Postoperative echocardiogram showed a marked decrease in a gradient across the mitral valve with improved left ventricular inflow opening [Video 3]a,[Video 3]b,[Video 3]c,[Video 3]d. The patient is doing well at follow-up of 6 months with improved effort tolerance and is awaiting corrective surgery for ectopic ureter. Anomalous mitral arcade is an extremely rare abnormality. The exact incidence of this abnormality is not known. Anomalous mitral valve arcade is characterized by the connection of the left ventricular papillary muscles to the anterior mitral leaflet, either directly or through the interposition of unusually short, thick, poorly differentiated chordae. Narrow spaces may be present between the abnormal chordae. The chordae extending between the posterior mitral leaflet and the papillary muscles may be somewhat more differentiated. The left ventricular inflow orifice at the level of the mitral valve is usually adequate in size. Mitral valve leaflets are normal or mildly thickened. A fibrous band extends between the superior aspects of the elongated papillary muscles that are in continuity with the free margins of the mitral leaflet mitral leaflets. Owing to this arc-like configuration when viewed from the left atrial surface, anomalous mitral arcade has also been reported as a “hammock mitral valve.” However, as originally described by Carpentier et al., the term “hammock mitral valve” is specifically used to describe the appearance when the valvular orifice is at least partially obstructed by intermixed tendinous chords attached to the abnormal papillary muscles. The malformation is thought to result from an arrest of mitral valve development at a stage after loss of muscle in chordae and leaflets but before the final attenuation and elongation of mitral chordae have occurred. Since the first description by Layman and Edwards, anomalous mitral arcade has been reported rarely; mainly in infants and children below the age of 3 years. This anomaly may result in mitral valvular insufficiency, stenosis, or both because of restricted leaflet motion and abnormal papillary muscle. The clinical presentation is varied depending on the relative severity of mitral stenosis and insufficiency. Surgery is often required at an early age, and therefore, reports of anomalous mitral arcade in adults are rare. Less than 15 cases have been reported in adults above the age of 18 with the oldest known survivor being 65 years of age., The clinical course in adult patients was associated with less morbidity than in children, most likely owing to a less severe degree of stenosis. However, as the anomaly is rare in adulthood, it might be underrecognized. Anomalous mitral arcade is considered to be the most difficult mitral valve malformation to correct because the subvalvular apparatus is difficult to expose, and the considerable amount of muscle underneath the leaflet causes obstruction of left ventricular inflow. In most instances, valve replacement is required. Of the rare cases reported in adults, less than one-third underwent successful mitral valve repair. In the series of repair of congenital mitral valve lesions by Prifti et al., repair of the anomalous mitral arcade was one of the strong predictors of poor overall freedom from reoperation and midterm survival. Nevertheless, the repair of such lesions may be feasible and should be preferred over valve replacement, especially in children. Three cases with “partial” hammock mitral valve , which is a forme fruste of hammock valve, wherein only the posterior leaflet is involved have been reported in adults. These patients have undergone successful mitral valve repair. The anomaly may be differentiated from rheumatic mitral valve disease, the most common cause of mitral stenosis in adults, by the absence of commissural fusion, normal or near normal leaflet mobility, and thickness, and the predominant involvement of the subvalvular apparatus with the typical appearance described above. However, there may be an overlap in these clinical features, especially in later life. Our case was also misdiagnosed as rheumatic heart disease elsewhere. An increased appreciation of the pathoanatomy of mitral arcade is warranted. Kutty S, Colen TM, Smallhorn JF. Three-dimensional echocardiography in the assessment of congenital mitral valve disease. J Am Soc Echocardiogr 2014;27:142-54. Carpentier A, Branchini B, Cour JC, Asfaou E, Villani M, Deloche A, et al. Congenital malformations of the mitral valve in children. Pathology and surgical treatment. J Thorac Cardiovasc Surg 1976;72:854-66. Chauvaud S. Surgery of congenital mitral valve disease. J Cardiovasc Surg (Torino) 2004;45:465-76. Hakim FA, Krishnaswamy C, Mookadam F. Mitral arcade in adults – A systematic overview. Echocardiography 2013;30:354-9. Kim SJ, Shin ES, Park MK, Choi SH, Lee SG. 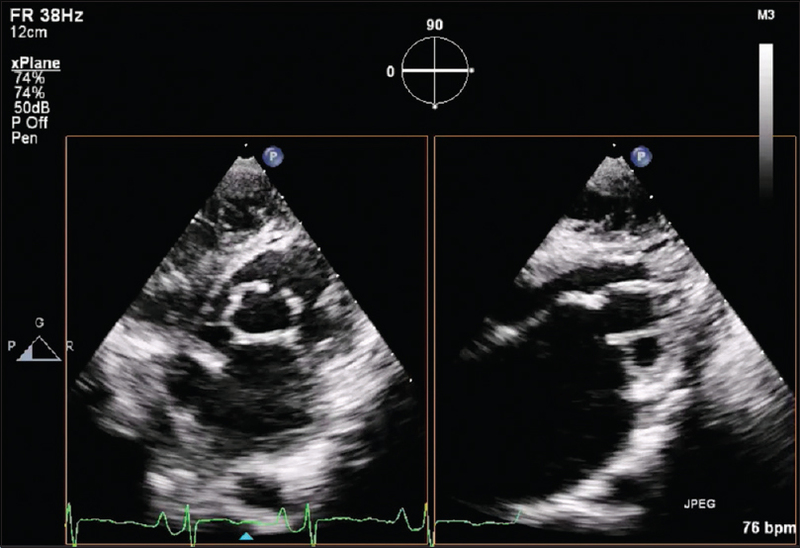 Congenital mitral insufficiency caused by anomalous mitral arcade in an elderly patient: use of echocardiography and multidetector computed tomography for diagnosis. Circ J 2005;69(12):1560-3. Prifti E, Vanini V, Bonacchi M, Frati G, Bernabei M, Giunti G, et al. Repair of congenital malformations of the mitral valve: Early and midterm results. Ann Thorac Surg 2002;73:614-21. Aramendi JI, Rodríguez MA, Voces R, Pérez P, Rodrigo D. Partial hammock valve: Surgical repair in adulthood. Ann Thorac Surg 2006;82:1103-6. Deo SV, Maalouf JF, Mankad SV, Park SJ. Mitral hemi-arcade: An unusual modification of a rare anomaly. J Card Surg 2012;27:699-701.